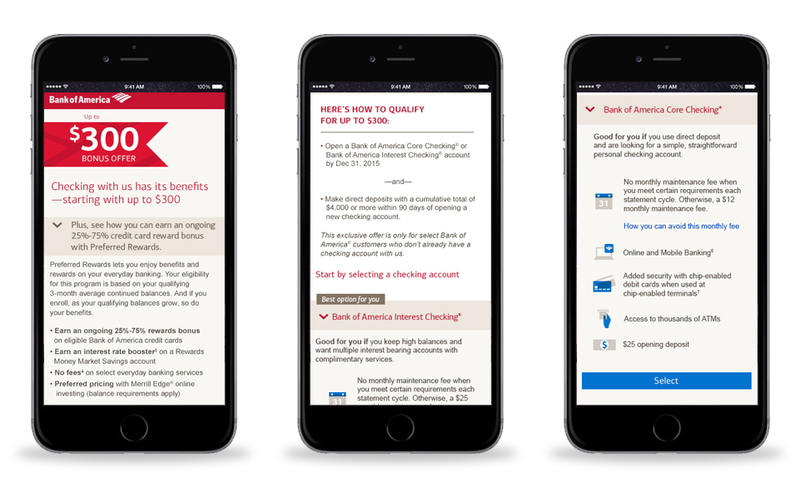 Bank of America tasked us with encouraging online banking users to switch to the brand's mobile banking app. Working with a team, we concepted big ideas, with creative activations: digital assets, experience design, and site takeovers. Below are a few activations that were my original ideas and I was the Art Director for. Remind Bank of America users that with the app, they have more time in their day to try new and different things, and trying mobile banking is something they should add to their list. We understand that many users are apprehensive about banking from their smartphones, but we want to assure them, that it's ok to try, and they'll like it. Masthead Activation: Digital assets that greet Online Banking Users when they go to sign-in to their accounts. Branch Makeover Activation: To capture the idea that you can "bank from anywhere," we'll transform select high traffic financial centers in to ski lodges, beaches, and other fun areas people would rather want to be. We will physically show users that they can "branch out" and bank from anywhere, by having the tellers demonstrate the Mobile App. Surveillance cameras will capture these moments, which will be compiled into TV spots and YouTube videos. Teaser videos will also be shown on our channels like "Why is this truck bringing 400 lbs of sand to this BofA center?" This isn't banking of the future, it's banking of the "now." We want to introduce how the Mobile Banking App is used daily, and take the fear out of technology. Future Throwback Activation: Playing off the "Kitchen of Future" spots of the 1950's we'd like to create parody spots that show the App isn't Banking of the Future, it's Banking of the Now. First we'd do a fun site takeover: no something isn't wrong with your screen! When a user goes to do their banking but online, instead of using the app, the site would be in black and white, and would change to color. The Technicolor site is brought to you by our Mobile Banking App. "Tips, Facts, and Cash Back"
Bank of America partnered with three celebrities to give DIY tips on how to save money, accompanied with videos. I designed the sub-landing pags for the Cash Back Card, to incorporate these videos in one organized pop-up window. Taking the desktop pages of the the different credit cards offered (desktop version repreented above), and redesigning them for a mobile format using a drop down method. 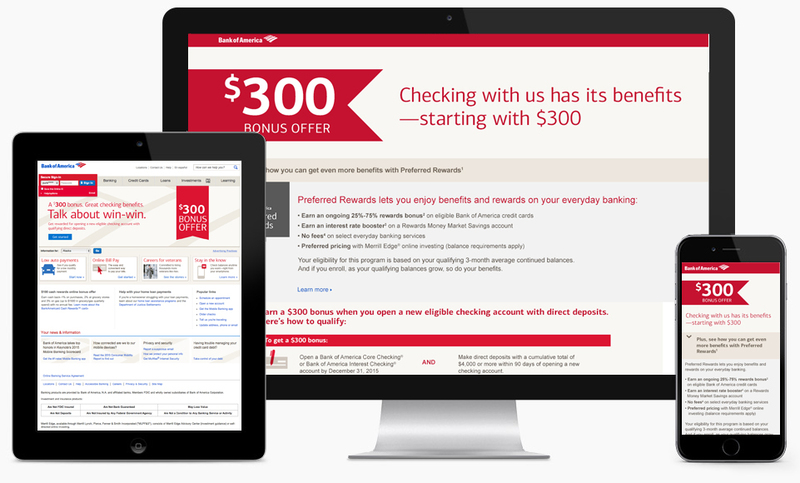 A re-design of the primary checking page, with the addition of adding the "$300" offer graphic. I designed multiple integrations how to display the $300 offer, and the client chose my ribbon design, which was then implemented on the Desktop, Tablet, Mobile, and Dotcom Assets. 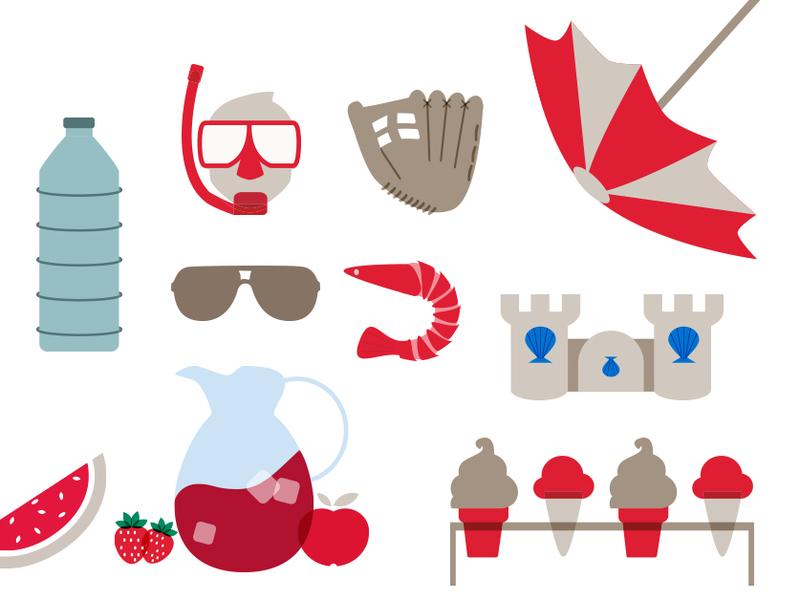 Iconography and illustrations for Bank of America, used across various media: print ads, banking center promotional material, websites, rich media ads, banner ads, and ATMs. These illustrations, designed by me, were not only used by myself, but other designers on the BOA team, and have become part of the BOA illustration database. Home Loans Digest, a mobile article with an infographic feel, to learn quick tips about renovations and maintenance, that links to more in depth Bank of America articles. Working with my ACD, we figured out which articles had more importance, which helped with display order and which articles received visual treatment. The Bank of America Cash Rewards™ credit card AOL sign in screen for a Summer unit. Illustrations created by me and organized to fit the AOL sign in template. 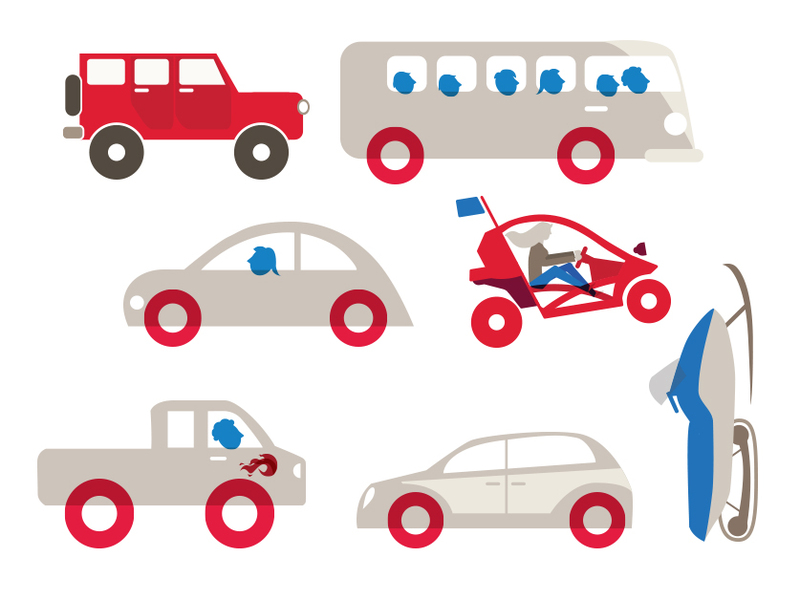 “Savvy Traveler”Bank of America’s Tips for travel, an iPad rich media unit. The idea was brought forward by the Creative Director, and I concepted the layout and illustrated the tips. “Baldy” Bank of America’s Fruad Verification product. Online animated advertisement promoting the Travel Rewards credit card. 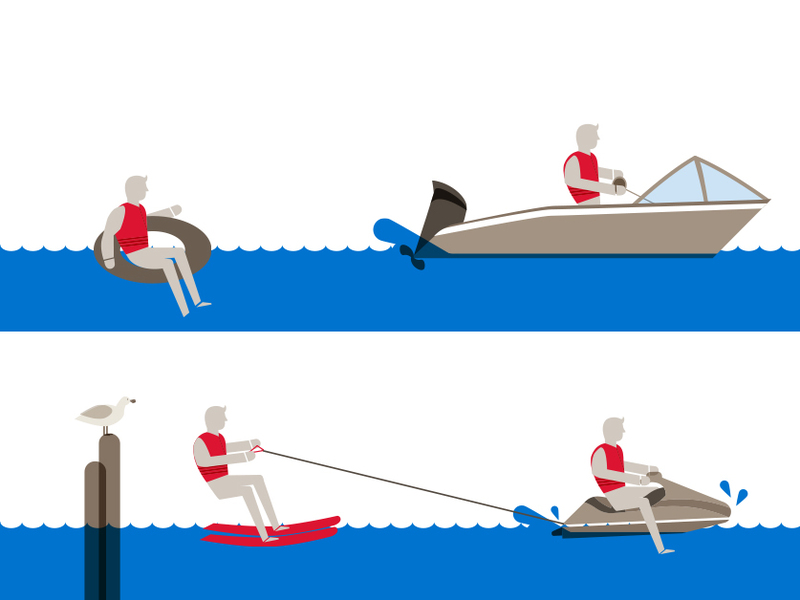 A concept presented by a teammate then elaborated and illustrated by myself. Bank of America's mastheads that are shown on www.bankofamerica.com advertising BankAmeriDeals. Copy was selected, and I had to concept multiple illustrations that demonstrated the lines in a fun and visual way.